The performance controls now are, mod wheel to shape, velocity to volume velocity to shape and velocity to envelope times. These controls wil add real expression to your playing. 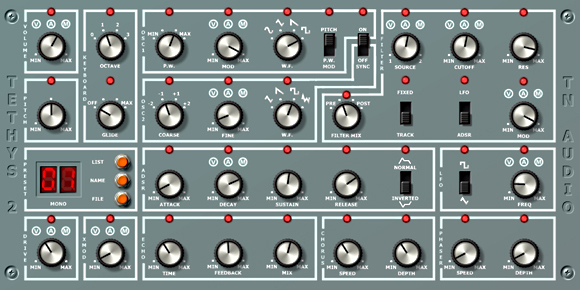 String synth based on nine detunable oscillators. Wave shape can be modulated by either the envelope or modulation wheel and the envelope can be switched from fixed to velocity sensitive, add to that a tone control and thats all the sound production you get. The rest is effects starting with a sixteen step gater with variable step length from 1/64th note to a whole note, plus ten slots to save your favorite styles to. Then a tempo syncable analogue delay, and finally a choice between a chorus for thickening up the sound or a phaser to make it go whoosh and sound like Jean Michel Jarre. Also some buttons for randomizing the sections if your really too lazy to turn a few knobs. Very low cpu considering even a simple three note chord uses twentyseven voices. 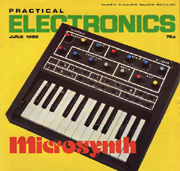 Based around the design by Allan Bradford in Practical Electronics magazine. "the author then consulted professional keyboard players in arriving at a panel layout which is both pleasing and ergonomic, that is non-confusing and rapidly operated on stage"
Having recreated it I would beg to differ, simple things like wondering why the filter is not having any effect, only to realize the oscillator is set to triangle which bypasses the filter, can at times have you pulling your hair out, so I would suggest anyone wanting to get to grips with it read the manual. Sound wise reminds me of the EMS VCS3 if it was made with very cheap components. This is reflected when pressing the randomise button, 90% of the time you will get horrible unusable sound if any sound at all, 9% industrial rhythms / 70's sci fi and 1% something you can actually play. At first sight it may look the same but it as different from 2 as 2 is from 1. New voicing algorithm so no difference in levels between poly and mono. ADSR changed from linear to exponential for a more natural sound. Pulse Width alters the duty cycle of the sine and triangle waves giving them saw like quality's. Pulse width adds more detuned voices to the saw, so minimum PW is 1 saw then 3 then 5 then 7. Modulation of the PW alters the amount of detune. Clicking where it says PRESET randomly generates a new preset. Clicking where it says LFO brings up 2 new shapes saw and sample and hold. Finally clicking where it says FREQ on the LFO or TIME on the echo changes them to note durations. The effects from right to left are Phaser, Chorus and Echo these are fairly standard but follow the Tethys ethos of keep it simple and therefore have the minimum number of controls needed. Then comes the X Mod the effect of which changes depending on Oscillator 2's waveform and the knobs setting (should maybe have been called Mod ?) and can sound depending on the settings anything from FM, AM, RM to badly soldered wires randomly distorting the sound. A great companion to the next effect the Drive, it started out as a recreation of an old Washburn SX3 pedal but as I tried to reduce the pedals three knobs to one it took on a character of its own. Its tone is also dependent on the amount of signal being fed to it by the volume knob, so to get the sound you want you may have to turn the volume down and boost it at your mixer. One last small change from Tethys 1 is to the program manager now if you hover the cursor over the number the name is displayed also clicking on the left number changes it to the previous program and the right the next. Modeled electric reed organ in the style of a Magnus chord organ, can also be used as a midi processor to transmit the chords. Not an emulation just based around the architecture of the PAiA Proteus 1, recreating the original Proteus 1 program manager drove hosts crazy so its been replaced by a standard one. Its simplicity and limitations bear no relation to the variety of sounds it can produce, though I think it does brash best, so if you want something to cut through a mix give it a try. Update 5/3/14 New version now bug free. Modeled on my two Yamaha CS-5's which were getting old and little sick. Unfortunately while finishing off and A/B'ing the hardware got very sick so I'm releasing as a beta version until I get the hardware fixed. 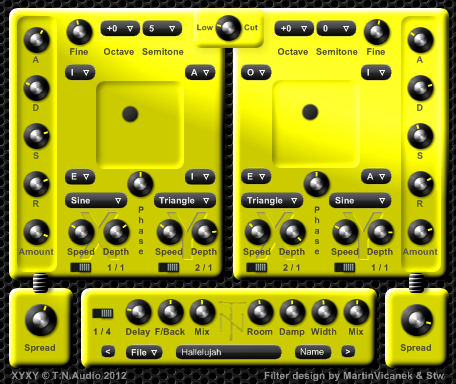 Only really of interest to other CS-5 owners who would like a vst version. Right clicking on any knob will bring up a list of midi cc's to choose from. 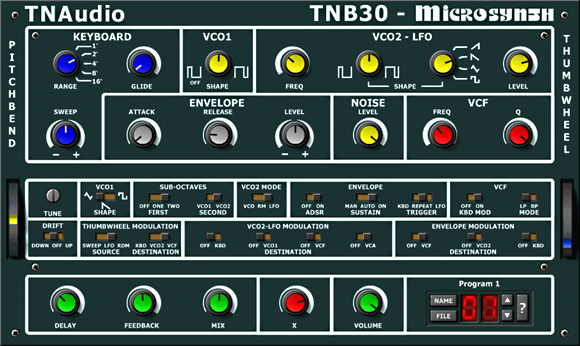 The download contains a vst instrument an effect to take advantage of its external input and a standalone. 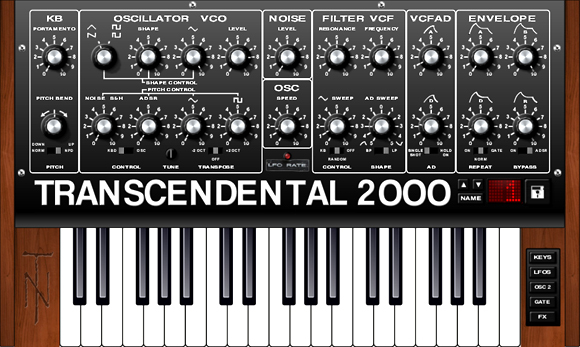 The Transcendental 2000 is based on the Powertran Transcendent 2000 a diy kit synthesizer from 1978. The front panel is a replica of the original except for the program manager and the page buttons on the right. Being to scale makes some of the labels a little hard to read (unless you have a screen large enough to scale it up to its original 26" width) but the knobs are fairly standard, the switches which operate some of the most important modes of the keyboard are less so. Below are descriptions for these switches. Norm / NPD These stand for normal triggering where if a key is pressed and held any more notes played will not retrigger the envelopes (basically legato mode) and new pitch detect where every key strike triggers the envelopes. KBD / OSC This is the gate signal sent to the amplifier controlled by either the keyboard or osc (LFO). Transpose Changes the pitch of the keyboard down 2 octanes, off and up 2 octaves. KB / Random / Off This is the filter tracking which can either be set to track the keyboard, be varied by the sample and hold or switched off. BP / LP This is for selecting filter type bandpass or lowpass. Single shot / Hold on Selects if the AD envelope should go straight from attack to decay or should stay at the peak of the attack until the key is released before decaying. 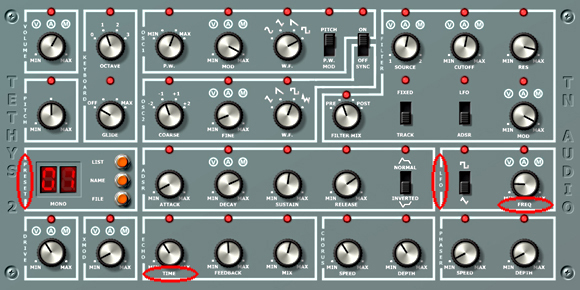 On / Norm / Gate This controls how the ADSR is triggered by the osc (LFO) either constantly, off or constantly while a key is pressed. On / ADSR This controls if the signal should bypass or go through the ADSR before the output. The KEYS button shows the keyboard as pictured above. The LFOS button brings up the osc (LFO) speed control page. 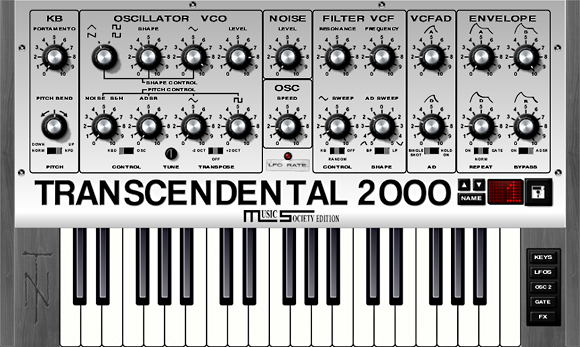 The frustrating thing about the original Transcendent was that there was only one LFO with seven destinations, so no slowly sweeping the filter over a bar while triggering the envelope with sixteenth notes for example. Here I've tried to remedy that by giving control of the speed for all seven destinations. The speed of the LFO is set with the osc control on the front panel and can be set between 0.06 to 20 Hz same as the original or by switching on the tempo sync can be set to note lengths of a thirty second to two bars either straight, dotted or triplet. Each destination can then be set to between sixteen times slower or faster than the speed set with the main control, these can also be switched to locked divisions of the speed in step mode. 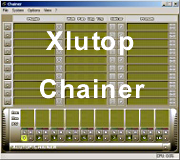 Triggering of the LFO can be switched between free running (off), legato and triggered by every key strike (on). The OSC 2 button brings up the second oscillator page. The second oscillator is a supersaw with controls for level, detune (saw spread) and plus or minus one octave in semitone steps detune. There is a switch to control how it reacts to pitch modulation either on, its pitch is effected by the pitch modulation section, off, the pitch modulation section has no effect or sync where there is still no modulation but the main oscillator is synced to it. The rest of the OSC 2 page is taken up by its dual vowel filter with controls for vowel mix, two for selecting the vowels, a control for the balance between the vowels or when switched to mod controls the amount of modulation between them, a switch for modulation shape, a control for modulation speed which like the LFO's can be tempo synced and finally a LED display showing the current position of the balance. The GATE button brings up the gater page. Controls from the left are Off / On switch, a switch to select if the gater effects the VCA, VCF or both and a switch to select if the gater syncs to the host tempo or is user defined by the knob to its right. This will also effect any other parts that are tempo synced. Next is the control for direction forward, bidirectional or random then comes the gate time (speed) selector to select between 1/2, 1/4, 1/8, 1/16 and 1/32 step lengths followed by the swing amount, the controls for the attack and release of the steps and finally the mix for controlling the balance between the original and gated signal. Underneath are a row of buttons for selecting which of the steps are on or off. The FX button brings up the dual delay page. Twin delays with tempo sync and the option to have them in parallel or serial. Released on the Music Society Forum with a modern look skin seen below only available to members so if you like the look join up. XYXY vsti is an instrument that consists of two supersaw oscillators which even at full detune are still harmonically pleasing with each oscillator fed into four user defined vowel filters, the mix of which can be either controlled manually or by two LFO's one for the X axis and one for the Y axis. The LFO's rate can be adjusted from 0 = off to 1.2Hz or set to a note length of the current tempo. There are two of these for each oscillator hence the name XYXY. Each oscillator has its own ADSR with volume amount and spread (supersaw detune) plus the usual octave semitone and fine tune. Effects wise it has a delay that can be synced to note lengths of the current tempo and a reverb both of which when their mix's are set to zero are disabled and can save quite a bit of CPU. Lastly there is the master low cut needed as some of the vowels mostly the A can with certain settings output very low resonating frequencies that can cause distortion. Final note the oscillators are not band limited so high frequencies will cause aliasing and I like to think can be useful as an effect. Update as of 4/10/13 also available XYXY version 1.1 with band limited oscillators, a little heavier on th cpu so use version1 if you cannot hear / like the aliasing and use version 1.1 if you can / don't. Both now come with standalone versions. Bar Synth Blue the first of the bar synth series, ideal for kids and touch screens as it can be programed with one finger with one stroke across the screen. The download below is an exe which can be scaled up so that each bar can be adjusted with one finger.